OCD™ Pellets By Doc's Products, Inc. 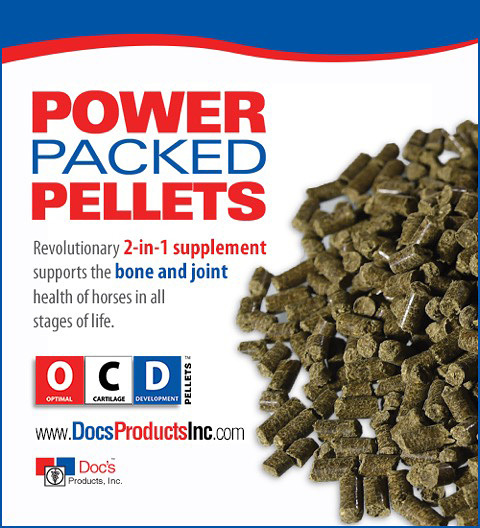 Prevent equine bone health issues with OCD™ Pellets! After twenty-plus years of veterinary practice, Dr. Douglas R. Beebe became concerned with the significant increase in problems associated with the equine skeletal system. After categorizing radiographs over a fifteen-year period, he began seeing increased occurrences of fractures, bone spurs, Epiphysitis, OCD lesions, Sesamoiditis, etc. His post-graduate work in nutrition lead him to conclude there was a nutritional basis for the demise of the skeletal system in the equine athlete. The philosophy behind the formula is this: Doc's Equine Products, Inc. guarantees results in 90 days according to your own evaluation – Money back guarantee! As a nutritional supplement that "Feeds the Bone," OCD™ Pellets provide the fundamental building blocks for healthy bone and aid in resolving skeletal injuries and joint pain in the equine athlete. Post-use radiographs of horses on OCD™ Pellets have shown resolution of Osteochondrosis Dessicans (OCD) — in many cases eliminating the need for surgery. OCD™ Pellets address the daily nutritional requirements in the development of the cartilage and bone for horses, regardless of age. Many clients feeding OCD™ Pellets to their horses to resolve bone and joint problems are now seeing pain-free horses which are able to be ridden and enjoyed. Osteochondrosis Dessicans (OCD) is the failure of the bone to develop a strong cross-linkage of collagen fibers. This condition affects the articular joint (cartilage), and often involves the subchondral bone just beneath the cartilage surface. Clinical signs develop when the cartilage in the joint starts to flake away, releasing debris into the joint and resulting in joint inflammation. OCD lesions can cause serious lameness and may show up only when the horse is stressed. Why Do I Need OCD™ Pellets? Throughout a horse’s life, its skeletal system is continually remodeling and changing as new bone is formed daily. Joint problems usually occur due to poor quality bone's inability to withstand the daily rigors of training and competing. A horse with healthy bones is a pain-free horse. OCD™ Pellets provide the fundamental building blocks for healthy bone and aid in resolving skeletal injuries and joint pain. Horses of all disciplines and levels of use will benefit from this revolutionary supplement. Whether you are a weekend warrior or a professional competitor, your horses will work better and stay sounder when OCD™ Pellets are a part of their nutritional program. What Do Customers Say About Our Product? I just wanted to thank both Sylvie and Dr. Beebe for being so very helpful on the phone with me. My order arrived so fast! 2 days! It was so re-assuring to speak with an actual Vet about my horse's condition. I will definitely keep in touch about how he progresses. I have a good feeling about OCD™ Pellets! I am extremely hopeful that finally there is an answer for my baby boy, Rusty! Our precious thoroughbred fractured his cannon bone last April. He went through electrical stimulation treatment, stall rest and the bone was healing, but slowly. We began using OCD™ Pellets and within a few months, our vet was shocked at the degree of healing! The fracture is very long and near the joint and they didn't believe it would heal completely. The last x-ray shows dramatic changes and all signs point to a complete resolution of the fracture. Woo hoo! We now give OCD™ Pellets to all our horses and have seen dramatic improvement. Thanks for a wonderful product!! OCD™ Pellets have all but eliminated bucked shins in my barn. Order Your OCD™ Pellets Today! OCD™ Pellets consist of only the best ingredients including proven joint supplement CORTA-FLX®, specific trace mineral complexes, essential amino acids, hyaluronic acid, silicon, plus key micronutrients required for the formation of a strong bone matrix. The feeding of OCD™ Pellets has been shown to resolve these conditions: Bucked Shins, Bone Lesions, Bone Cysts, Sesamoiditis & Fractures, as well as support joint health. You can also order at "Heartland Vet Supply" or "AllVetSupply"... or even directly through us!